PALMETTO, Florida – Truckers serving Port Manatee, having been recognized with a free lunch, can look for nourishment of their souls throughout the year thanks to a new ministry of the port-based Anchor House Mission. 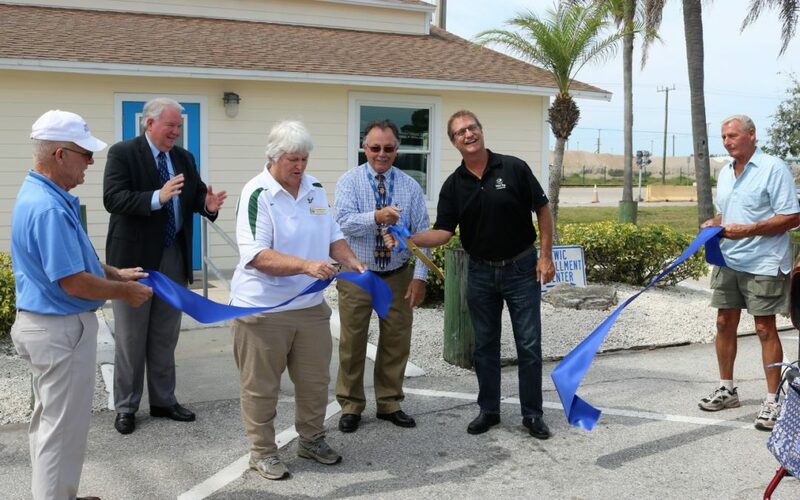 The not-for-profit Anchor House Mission’s Trucker Ministry was unveiled Friday [May 12] with opening of a rest-and-refresh area for professional drivers at Port Manatee’s scale house. The ribbon-cutting was followed by Port Manatee’s second annual Trucker Appreciation Day, during which more than 400 hot dogs and hamburgers were provided to nearly 300 truckers just outside the port’s main gate. “Port Manatee makes us feel very appreciated,” said Manny Gutierrez, an owner-operator who drives for Jacksonville, Florida-based Landstar System Inc. Dozens of Port Manatee executives and employees were joined in serving the picnic-style lunch by Priscilla Whisenant Trace, the Manatee County Port Authority first vice chairwoman, as well as Carol Whitmore, past chairwoman of the port board. Trucker Appreciation Day sponsors included Logistec Gulf Coast LLC, Federal Marine Terminals Inc., Arrow Terminals Inc., World Direct Shipping, TransMontaigne Partners LP and Manatee Truck & Trailer Wash LLC. Port Manatee, the Port of Port Manatee Propeller Club, TravelCenters of America, Pilot Travel Centers LLC and Wildwood, Florida-based 75 Chrome Shop provided drivers giveaway items including T-shirts, caps, calendars and notebooks with pens. Participants in a May 12 ribbon-cutting ceremony for the Anchor House Mission’s Trucker Ministry include, from left, Dave McIntyre, Anchor House board member; the Rev. Tom Winter, pastor of Elwood Park Baptist Church of Bradenton; Priscilla Whisenant Trace, Manatee County Port Authority first vice chairwoman; Tim Huppert, Anchor House executive director and chaplain; Ron Sikkema, Anchor House board president; and Bill Oostendorp, Anchor House board member. At Port Manatee’s second annual Trucker Appreciation Day, from left, drivers Manny Gutierrez and Armando Perez are served lunch by Malcolm Edwards, Port Manatee’s senior manager for trade development.